The Dachshund, bred to flush out badgers, is long and muscular with short legs giving it an elongated 'weiner' or 'sausage' appearance. The Dachshund, whether a Standard or a Miniature Dachshund, is a lively and entertaining companion dog. They are often mischievous, and are quite bold. Dachshunds travel well and are loyal and protective. When selecting a Dachshund, it is important to check for back problems. They may also develop heart disease, diabetes, eye problems, epilepsy, or urinary tract problems. Breed Type The Dachshund is a hound breed. Standard Dachshunds were bred to flush badgers, while the Miniature Dachshund was bred for rabbit hunting. Background The modern Dachshund originated in Germany, and references to the breed can be found in books dating back to the early 1700s. Originally much larger than they are today, breeders succeeded in giving the breed shorter legs that were more suitable for digging. The Dachshund was brought to the United States in the late 1800s. There are long-haired, wired-haired, and short-haired Dachshunds, as well as Standard and Miniature Dachshunds. Although not recognized by kennel clubs, some breeders also breed Toy or Mini Dachshunds. These dogs are under 12 inches and weigh 8 pounds or less. Description The Dachshund is long and muscular with short legs. Its head is long, with dark eyes and long ears. The breed may have short, long, or wiry hair. Color variations include solid tan or yellow, bi-colored black, brown, gray, or chestnut, and piebald, speckle-streaked, or harlequin. The term 'Dapple' describes Dachshunds with merle coloration and the term 'Wild Boar' describes Dachshunds that are dull gray intermingled with black in color. Standard Dachshunds are 14-18 inches tall and weigh about 20 pounds. Miniatures are up to 14 inches tall and weigh around 9 pounds. Care and Feeding Many breeders suggest feeding Dachshunds puppy food throughout their lives. Their diets should include horse meat, beef, wheat, and yellow corn. Care should be taken to avoid overfeeding, as these dogs are prone to obesity. Grooming requirements depend on the dog's coat. Long-haired Dachshunds need daily brushing. Wire-haired Dachshunds should be brushed regularly and trimmed twice a year. Short-haired Dachshunds can simply be rubbed down with a damp cloth. Dachshunds shed moderately, so regular vacuuming is required. They also have a bit of an odor, necessitating regular shampooing of the carpet and cleaning of furniture. Housing Your Dog Dachshunds are usually kept indoors, and will do well in a small space. They are active indoors and out. Social Behaviors Dachshunds are friendly and outgoing, and they get along well with familiar people. They are best suited to adults and older children. Dachshunds get along fairly well with other pets, but may become jealous of them. Handling and Training Dachshunds are willful dogs, and they require consistent training. They are difficult to housebreak. Activities Dachshunds need daily walks and play sessions to keep them healthy and at an optimal weight. These dogs can injure themselves by jumping around too much, so it should be discouraged. Breeding/Reproduction Hereditary problems of Dachshunds include epilepsy, Cushings disease, thyroid problems, and certain eye conditions. Bloodlines of potential mates should be checked for these. Common Health Problems The most common health concern for Dachshunds is back problems. Intervertebral disk disease is quite common. Their long spines are easily injured, so it is important to take precautions to prevent them from getting hurt. 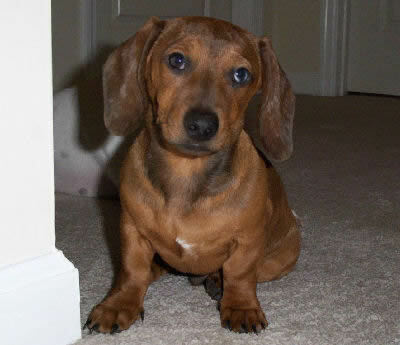 Availability The Dachshund's immense popularity makes them a favorite of breeders, so they are usually easy to find. Prices vary, but are usually between $350 and $700. Ok so my wiener dog won't stop crying she is 2 years old and we feed her regularly but she won't stop crying. Sometimes if one of her toys is under a blanket she does it but now she just randomly cries. Please help. Hello can someone please tell me why does my dog cry all the time. She is fed clean and very active not jumping a lot but running around. But she cries non stop. Does she whine when she cries? Or is it tears? If it's tears, Rudi had eye duct issues and our vet had me massage (gently) her tear ducts. If it is behavior our mini, Spud, is a worry wart! He whines and will shake when he wants his way or we, in his thinking, are paying too much attention to our other pets. Then if that doesn't work he rolls over on his back and gives the big puppy dog eyes, shakes his little paws in the air (playing the 'I'm sooo cute card')! It took me a while watching him and to figure out how insecure he was. Now I make sure to give him the little extra snuggle. But he still occasionally shows the worry wart behavior. That's his personality! Toby is our 5 yr old red dapple doxie weighing 19 lbs. He had injured his back in October. He was unable to stand or use his back legs. We took him to the Clinic within 12 hours of the symptoms. Toby was given anti-inflammatory and pain medication. Total confinement was the call for a 30 day minimum and possibly 6-8months with surgery if no improvement. My wife and I went home with little hope of recovery. We understood the confinement but how were we going to assist with Toby's daily bathroom trips? What we came up with was a real simple solution. My wife made a device that allowed us to carry Toby out and assist him when he needed to both urinate and defecate.The device allowed us to support his weight and minimize his movements with no discomfort to Toby. We kept him more in the device than in the crate. We could hang him up on the patio or a tripod I had placed in the yard. the device also allowed for him to use his back legs and as he improved we could let him bare more of his own weight. We took Toby back for a visit 2 weeks after his injury and the Veterinarians (4 in this clinic) were absolutely stunned and amazed at the device and the progress Toby had made. Toby is now on his own and running again with his friends. We have submitted for a patent at the instance of our veterinarians. The device will soon be made available but for now we are just wanting to help others. Hi Bruce, where can I get this or can I make something simular? I have a 4 year old mini-dachshund that is 9lbs and she has injured her back. We are doing all the same things as you but not the device you spoke about. I have no interest in creating this to sell (stealing your idea) but we want to help our dog Lilly, regain her back leg use and mostly get rid of her back pain. Please contact me if you are willing to help us out. Thanks! My name is kathy and I have a little Datschund dog named "oscar". For some reason he woke up with a fever and could not walk (his back legs don't work). I have not carried him to the vet because today is Sunday. I will carry him tommorrow.I love my dog very much and I Hope he will be able to walk on his own. Please let me know what I can do to help my little Oscar. If I lose him I will be devistated. He is only 6 years old and has a long life ahead of him. Please Help Us!!! My dog has suffered the same injury, with similar symptoms of not being able to walk. He cannot and will not stay confined to cage rest. I'm very interested in the device you have mentioned. My sister's doxie has this very same issue right now. He drags himself around, surgery has been recommended, but she can't afford it and doesn't have the heart to lay him down. Do you think this could help her doxie? I know this is 2011 but I have a 6 yo black min. dash who weighs 11 lbs. He just quit using his back legs one evening. Took him to vet next day and he is now on meds. I am so wore out taking him to the bathroom and holding is rear end up. Please help!!! This is day 4 and we do not see a surgery for consultation till day 6. Need some assistance. This sounds like something we would be interested in, for future use. Where would we get it and for what cost? I'm really happy that Toby is getting along fine now. Good luck with his progress. I,like others here, have a similar problem and am facing having to put my dapple dauchund down. He has a slopped disc pressing on his spinal chord. We can't afford the 3- 5 K for the surgery to fix. So my vet is trying to treat him medically over the next few days looking for improvement or for possible feeling and use of his back legs. If it doesn't work do you think this device could help us take care of him at home. Would you be able to sell me one? Thanks for any advice you can give us. Oh man why didn't I see your message two weeks ago. Our Dash-approx. 6 years old came down with IVDD and was put on a DSMO drip back in March. But just had reoccurence 2 weeks ago. They tried the DMSO again but it didn't work. He had no bowel control and could only drag his hind legs. Heartbreaking. Sadly we had to put him down so he would not suffer. I am just heartbroken and really wish I had seen this sooner. Thanks for your letter and invention. Hope it helps others. And good luck w/ Toby! Ok... So I was saying the vet told me if this didn't help Nacho, the surgery would be needed to get him out of pain, then he'd need a wheelchair for dogs. Well, again, everything worked!! Hes still improving every day, and he's the proudest little guy ever! If this happens to your dog, just be committed, and keep your dogs spirit up. Don't lose faith! Give them extra love and let them know you're with them thru it all. I forgot to mention, when this all happened, Nacho jumped in my lap off the floor. Thats it.. Next thing I know, he kind of crawled up me, and started yelping. He was COMPLETELY paralyzed on his back legs (basically his mid back to his back toes) and had the most frightening look in his eyes. This is a popular thing that happens with little dogs, and its common to happen more than once if it happens the first time. Just keep them from jumping up on things no matter how small the jump. Good luck, and I hope our story has helped someone. We have two Dachies, a standard female named Rudi and a mini named Spud. Rudi is older and started getting stiff. She hasn't majorly hurt her back but when she stretches she would pop and crack. This concerned me. One day while roaming my local pet store I found a snack that contains Glucosomine and MSM (just like I take). Now she stretches all the way, she isn't popping anymore. Neither do I so don't feel bad k.